My second Comfort Loop rotary cutter in nearly 20 years of quilting! This is the cutter I’ve used my whole quilting life, so it’s really comfortable in my hand. I don’t get any wrist pain during long cutting sessions because it promotes a pretty neutral wrist position. This is the most affordable of the three cutters and is a best seller on Amazon. The blade can be a little tricky to change. You have to take everything apart to get the blade out and then align a flat edge on the screw to get the bolt to seat back in the cutter. The button for closing the blade can be a little sensitive. While it’s designed to close without cutting you, it always scares the crap out of me and I need a minute to count fingers and calm down! It is really easy to change the blade on this cutter. You unscrew the nut, push on the orange guard near the lock button, and pull out the blade. Every rotary cutter should have this feature!! This cutter forces your wrist into a neutral position during the entire cut. 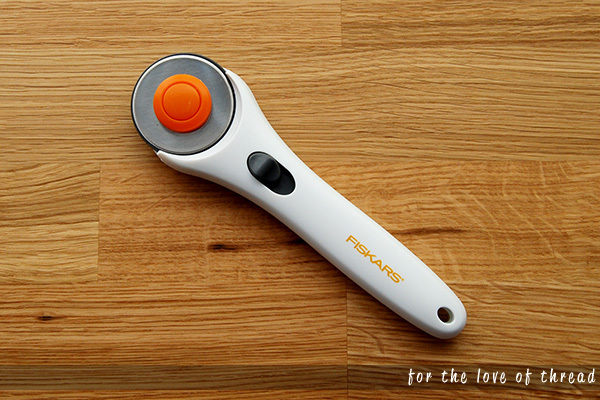 If you have weak wrists or problems with carpal tunnel, this might be a great cutter for you. I was really excited to get this one out of the packaging and give it a try. I was disappointed. The plastic handle and the orange button on the side to lock the blade just seemed flimsy to me. This cutter is not adaptable for left-handed cutters at all. You need to keep a firm grip on the handle once it’s unlocked to keep the blade “out” during your cut. If you have a weak grip, this might cause you problems. This is truly made for right-, left-, and ambi-handed cutters. 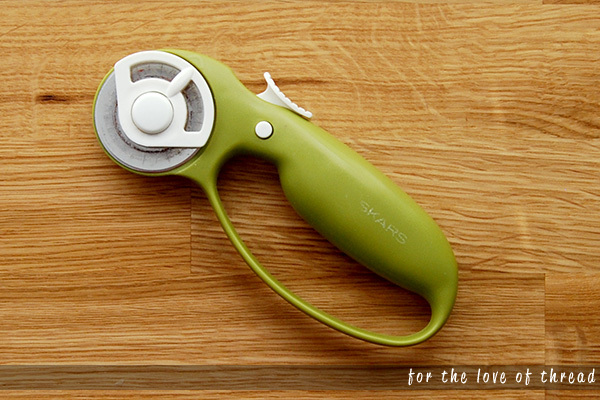 By simply turning the handle over in your hand, you can put the blade in the right position for cutting without having to swap the blade to the other side. It’s not the blade that moves when you “close” this cutter. There is a guard that slides up to cover the blade. This really helps avoid having heart attack-inducing accidental closures! Changing the blade is easier than the Comfort Loop but nowhere near as easy as on the Ergo Control. At the end of my test, I’m likely going to stick with the Comfort Loop I’ve been using for so long. Although I do find myself reaching for the Classic Stick when I want to keep switching hands for cutting. 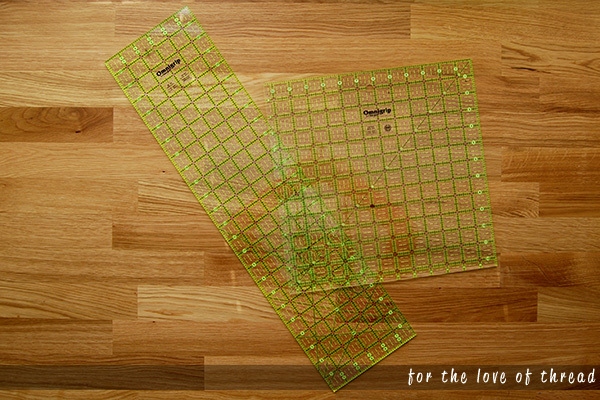 There are two tools you need to complete your rotary cutting station: a self-healing mat and quilting rulers. This is the cutting mat I use. By taking care to lay it flat and clean it regularly, it’s lasted forever. These come is a variety of sizes from 6 inches square up to about 24 X 36 inches. I can’t recommend this larger size enough. It can be expensive, but having the room to lay out your fabric without having to shift layers between cuts is the best. When I make my initial cuts, I fold my fabric selvage to selvage. Since quilting cotton is around 40 inches wide, that means I don’t have to fold it over again and cut through more than two layers of fabric. I find I’m most accurate when I have two layers to prevent the fabric from shifting. 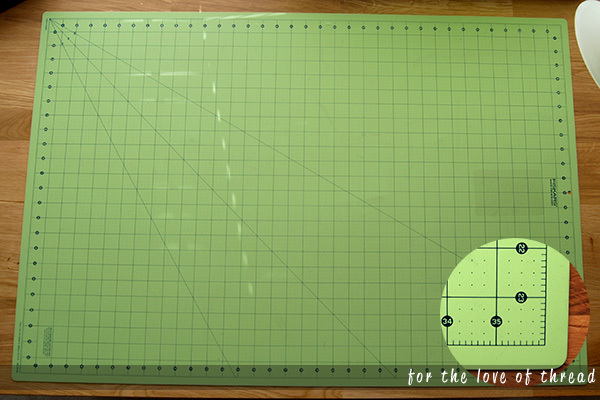 At the very least, one side of your cutting mat should be 24 inches so you can cut like this. It’s also important to make sure your mat is labeled “self healing.” These mats have magical properties that close up any cuts that might go through your fabric and into the mats. (I’m sure it’s really science, but whatever.) If you keep your mat lying flat by keeping it on a table or stashed under your couches, it will last you forever. And most mats are double sided. I switch mine over from time to time to give each side a rest. These are the two rulers I think every quilter should have: 6 X 24 and 12 1/2 X 12 1/2. You’ll use your rulers to measure your cuts and to have a straight edge to cut against. These also come in a variety of sizes. I recommend having one long ruler and one square ruler at a minimum. The long ruler allows you to cut your long strips without having to reposition the ruler in the middle of a cut. I started with a 6 X 24 inch ruler but recently added an 8.5 X 24 inch ruler and absolutely love it. There were so many times I needed to cut pieces longer or wider than the six inches, and this new ruler rarely doesn’t handle my needs. Square rulers are great for – well – squaring up blocks. I like to trim my half-square triangles after they’re sewn together, and these square rulers allow me to line up the diagonal seam on the 45-degree line of the ruler and get perfectly square… uh… squares each time. I have square rulers in three sizes: 12.5 X 12.5 inch, 8.5 X 8.5 inch, and 3.5 X 3.5 inch. They all have their purposes, but I recommend the larger ruler if you can only get one. What are your favorite features of a rotary cutter? Do you feel more confident picking one out after reading my tips? Have you gotten a self healing mat to heal? I have! A lot of TLC goes a long way. 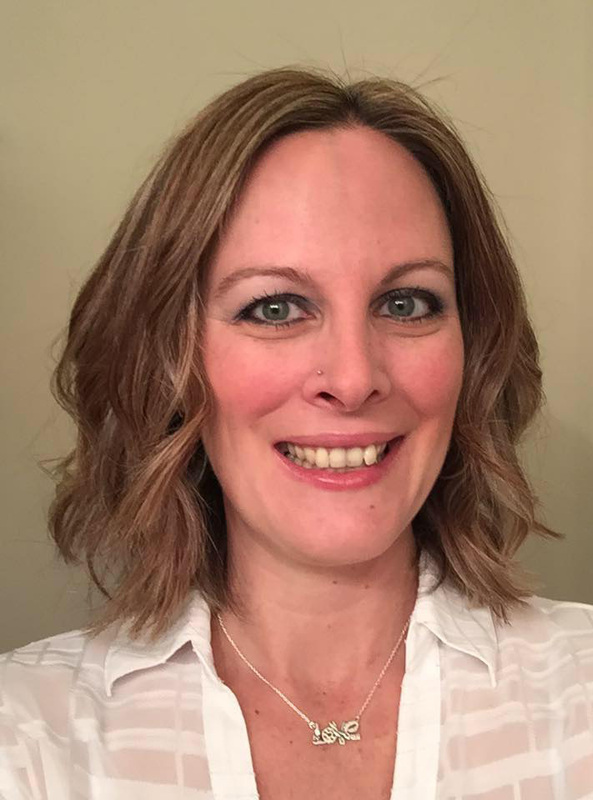 I always keep it flat, and I wipe it down with a damp paper towel after every major cutting session. That seems to grab a lot of the threads that might otherwise get stuck and keep it from healing. I also flip it over every month or so to give each side some time to rest. I own the one in the middle and the one on the right. the one on the right is the 60 size, it was great when I first got it, but now the safety button will not let me release the blade to its fullest. Have to hold the safety button in to get it to work. 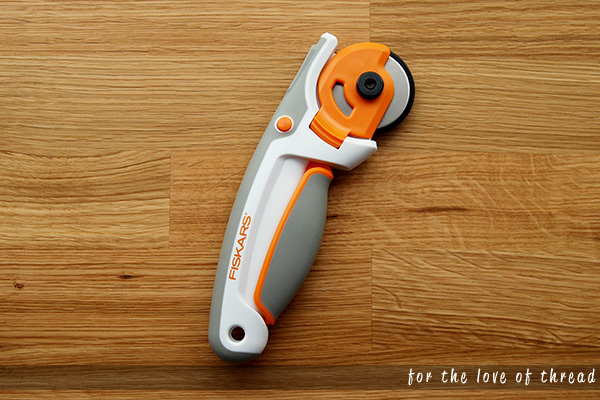 I still do prefer fiskars over any other brands. Their blades also usually hold up better than other brands. Ouch! How do you keep your thumb from hurting when you cut? But they last forever if you treat them right. 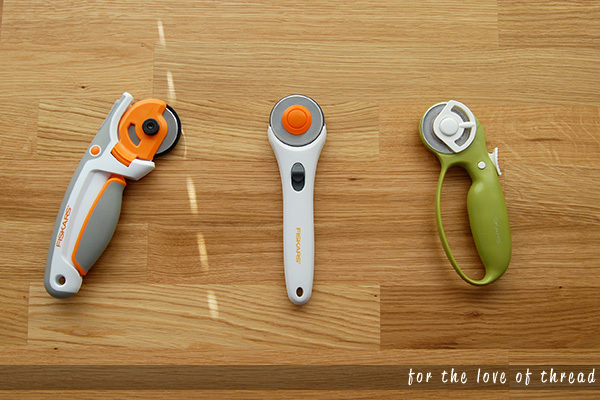 And I agree about Fiskars. I think they’re the best.